Game of Thrones will be ending soon (although the book series still have two more books left), but before we say goodbye I want to look at the most recognizable aspects of the TV show: the intro title sequence. It starts off every episode, giving us a taste before we’re plunged back into the show. In honor of the Game of Thrones intro, let’s look at seven of best alternative intros floating out there on the world wide web that, in another universe, we could have gotten instead of the one we are know. Ever wanted to go back in time and see what Game of Thrones would be like? The show would probably be worse, but the intro would be something to behold. Well, guess what? It exists in 2019. According to this user’s description, Scott Bradlee and Dave Koz teamed up only a few years ago to write the music for their intro, but if I hadn’t looked that up I would have been stuck thinking it was lifted from some B-movie from the sixties. It’s that good. Here’s their iTunes if you’re curious. Still not sold? Well, to add to the artistic value, there isn’t a clip of a single character in this intro. It’s all drawings, coming in and out (such as a moon that waxes and wanes, symbolizing the days Jon Snow stays at the Night’s Watch), and each one is highly detailed yet simplistic. The best? Some of them are specific moments from different seasons. It’s fascinating. Watch this intro, listen to the beautiful intro, and comment below if you can notice what each of the drawings mean. If your best friends on Thursday night Rachel, Chandler, Joey, Phoebe, Ross, and Monica, then this intro parody is for you. And if you’re not, check it still because it’s a work of art. F.R.I.E.N.D.S is now S.T.A.R.K.S, the upbeat tempo is hilarious coupled with this dark and dreary imagery, and the editing is top notch. When everyone claps in the soundtracks, the crowd, including Sansa beside a peevish Little Finger, stands up to clap. “Your jobs a joke…” plays right before Ned Stark looks at the crowd, about to get his head chopped off. “When it hasn’t been your day, your week, your month/Or even your year…” just fits the Starks so well, and just seeing Ned and Robb and Catelyn and young Bran who can walk we’re instantly reminded of all the terrible things that have happened to the Starks. But the chorus? “I’ll be there for you” gives us hope that there is light at the end of this tunnel. 80s nostalgia is so last year. Now I want 90s nostalgia! I want my toys and movies and shows from before I was born and up until was four to come back in the public consciousness, and this intro tricks my little heart into believing that the 90s classic Game of Thrones has been unearthed. Seriously, this thing looks straight off of a VHS. And the music? Oh, this is back when the 90s still sounded like the 80s but, in their effort to add something new, made everything sound like a mix between rock and pop. And the font? I normally don’t nerd out about character fonts, but this makes everything seem like a sitcom which….it just fits. The only thing I would add to make it more 90s is Kevin Sorbo of Hercules fame. With a rocking yet near mystical blaring guitar, this intro reimagines a Game of Thrones intro in the style of Beverly Hills 90210. The music’s rocking beats match up with knights beating on each other, the firing screech happens just as the camera zooms into Sansa’s terrified face and Robert Baratheon stands up with an “oooo” face. The addition of ‘Dolby Surround’ at the bottom adds to the aesthetics, the color fading in as each character is introduced, and Joffrey walking in with the nicest smile, getting comfortable on the thrones with the cutest face, and talking to Sansa as the sun sets. He seems like such a nice kid, except he doesn’t smile when the camera brings up his name and the color fades in…almost like the creators of this intro are hinting at something. But the best part of this intro? The ending. Just, just check it out. Yes, Season 23 of The Simpsons had way too many couch gags, but we can all agree that the eight couch gag is the best…mostly because it’s because Game of Thrones. The intro starts out with its best foot forward by killing Homer Simpson – running him over and pinning him to the garage show – which is by far the best move the show has down in years. As the intro goes on, we get many Game of Thrones references. Some examples are how everyone is seen in GoT-style clothing and how the music is obviously the GoT’s theme. The less obvious but still blatant would be how Grandpa Simpson’s face in carved into the tree Bart’s treehouse is on. A weird move, if you didn’t know Game of THrones, but us fans know that Bart now has a “weirwood treehouse” (I’ll stop). There’s also the fantastic choice of having Mr. Burns living at “Burns Landing”, turning the grumpy old man into Tywin Lannister (so, really, nothing’s changed). But then three eyed ravens (or maybe they’re crows? We can hope, fellow book readers…) fly up and across the screen, showing us the couch in the distance. It’s the biggest laugh because…well, it’s just a couch. It’s not made of Iron, it doesn’t even have spikes on it – it’s just a couch, and everyone wants it. What other references did you noticed? Comment below. Let’s get to the best one of them by asking ourselves this one question: What if Game of Thrones was just about Arya Stark? What if, and hear me out, we only focused on what awesome we all know she is? Well, our ultimate murder baby is getting her own intro. 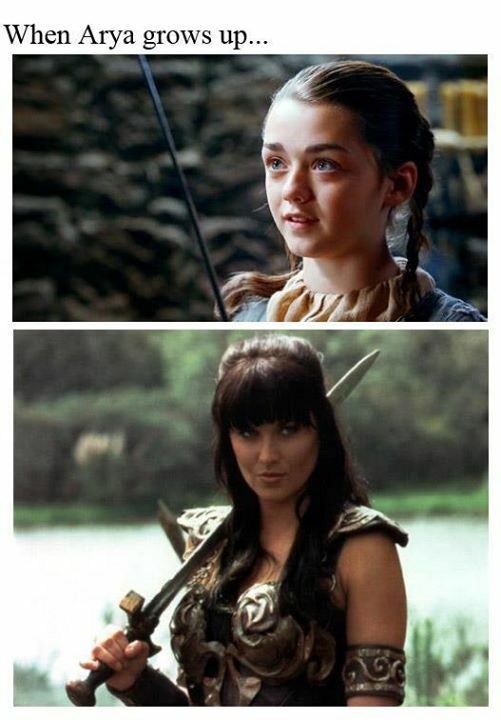 Here’s an ode to Arya in the style of Xena: The Warrior Princess. “In a time of ancient gods, warlords, and kings” the intro goes, cutting from the Blood Raven Tree, to the Battle of Black Water, to Joffrey’s smug face, showing how this is the greatest idea eva. It’s the next Simpson’s couch. We haven’t even gotten to Arya yet. Heck, we’re barely past the ten second mark of this video. When Arya steps in we get these steady horns that announce her presence before we see her face. Cut to some nobody getting killed, cut back to the horns and we see Arya’s face: focused, but young. Calm, but curious. Cut to sweet luscious sounds as Arya rides a horse through a forgotten wilderness, showing this is her journey, her story. “A mighty princess forged in the heat of battle?” This intro was made for Arya. I don’t even need the montage of murder with the choir chanting something that I don’t understand to get me pumped, I’m pumped already. But how would this Arya: Princess Warrior show end? No clue, that depends on how the real show ends. What are your thoughts? What if you were a LEGO? What if I was a LEGO? What if Game of Thrones was in LEGO? Then this would be their intro.